“New degree course to tackle complex environmental issues at the National University of Singapore,” by Neo Chai Chin. Today Online, 25 Feb 2011. SINGAPORE – In August, the National University of Singapore (NUS) will welcome 50 students whose idea of fun is doing field studies on Christmas Island, or learning the myriad issues behind haze in the region. The students will form the pioneer batch of the new Bachelor of Environmental Studies programme, a four-year, direct Honours course. Environmental issues are too urgent and wide-ranging to be tackled in a fragmented way, say the leaders of the taskforce that designed the inter-disciplinary curriculum. During discussions, “it impressed on me, really, that as a social scientist…I’m only trained to appreciate one fragment of the entire global issue”, said sociologist Paulin Straughan. The taskforce was co-led by NUS Faculty of Science special projects director Professor Leo Tan, a respected conservationist. The involvement of eight NUS faculties and schools – including the Arts and Social Sciences, Science and Law faculties – in the programme signals just how broad-based it is, said Prof Tan. In the first two years, modules in biology, chemistry and economics, among others, will be taught. Subsequently, students may opt to specialise in either Environmental Biology or Environmental Geography. Field studies will be conducted at places where NUS already has research interests – such as Christmas Island and possibly northern Thailand. On Christmas Island, students will see first-hand the delicate balance between conservation, development, tourism and migration. Another intriguing issue is the haze. “We always complain that the Indonesians don’t care about haze and they burn, but if you go to places that have been burnt, you find the problems there are very complicated. Some companies there are owned by… multinational corporations,” said Professor Peter Ng, director of the Raffles Museum of Biodiversity Research. Prof Tan said NUS hopes to attract “top-notch A Level students” to the course. Students need to have a “good” pass in Maths and either Biology or Chemistry, though exceptions could be made, said Assoc Prof Straughan. The Loke Cheng-Kim Foundation invites students who have applied for admission to courses leading to first degrees conferred by established local and overseas universities in the 2011/2012 academic year to apply for scholarship awards. Applicants should be Singapore citizens or permanent residents and should not be current holders of other scholarship awards or grants. This year, the Board is looking particularly for applications in the fields of Natural Sciences, Environment, Horticulture, the Humanities and the Performing Arts. Candidates should ideally have a strong record of academic and co-curricular achievements, but consideration will also be given to those who can demonstrate a capacity for independent thought, together with a real passion for and commitment to their chosen field. Candidates will be asked to accompany the prescribed application form with a personal statement (maximum 300 words) stating their career aims and aspirations, and how they see their chosen university and course of study as helping to achieve them. A scholarship’s annual value will cover fees and book allowances, initial clothing allowance, maintenance allowance and return economy class airfare and is tenable for the whole undergraduate course of study leading to a first degree. Applicants shortlisted for interview will be notified by 30 April 2011. About the talk – South China is at the northern limit of the Indo-Burma Biodiversity Hotspot, but also a hotspot for human development, with bustling cities like Hong Kong, Shenzhen and Guangzhou. The long history of human presence means wildlife habitats are highly degraded and fragmented, and biodiversity is under immense threats. Kadoorie Farm & Botanic Garden, a Hong Kong-based NGO, has been working in this region for over ten years, in a hope to minimize biodiversity loss and promote sustainability. In this talk, I will share about some of the work we do, what we’ve learned, and what remains to be done. About the speaker – A life-long interest in wildlife has seen Bosco choosing a career to be a conservationist. He obtained his Zoology degree in the UK, before coming back to Hong Kong for his Ph.D. on freshwater fishes. He has since worked at Kadoorie Farm & Botanic Garden, doing something he’s been dreaming of – to conserve the forest and wildlife of China. He is a member of the IUCN/SSC Amphibian Specialist Group as well as Primate Specialist Group, and the Chinese Ichthyology Society. His work brings him to some of South China’s last wildlife refuges, privileged enough to be working on rare animals like the world’s most Critically Endangered primate the Hainan Gibbon, as well as finding a few new species for science. Goh Kai Ying on the SEP Experience at Auckland: Getting tough! Being away from home for five months can be very daunting. It wasn’t just the mental challenges, it took my body quite awhile to adapt to the cold and dry climate of Auckland, New Zealand. Even as I reminisce about the ‘roughening and toughening’ I experienced, SEP was all worth while! I began exchange experience with a week of getting and being lost. While my five NUS schoolmates had taken residence in the university hostel, I lived in the suburbs with a kiwi family. Getting home was tough as the bus frequencies and routes were all unfamiliar to me. So I spent that week taking the wrong bus, alighting at the wrong stop and missing the bus. With daylight hours in winter quite short and the streets not exactly exhibiting docile Singapore conditions, the fear of lurking bad guys triggered lots of adrenaline through my blood! With familiarity though, I began exploring Auckland beyond school and home. Weekends became fun-packed short road trips to various towns on the outskirts of Auckland. But fun and danger always come hand-in-hand. Once up a ski mountain, Mount Ruapehu, my group of friends ventured beyond the training grounds to the higher ranges for a taste of death. The combination of poor control and bad brakes battered our heads and butts, but the domino effect ending with laughter. Meeting and getting to know new people is an integral part of the exchange experience – package. There are unpleasant individuals everywhere, but the friendly ones do make up a fair share. It was the people who make the SEP really memorable for me and the best parts of my experience were the shared ones. In particular, I had my New Zealand family whom I bonded with and truly felt to be a part of. Those genuine feelings are hard to describe but priceless. The SEP experience began from the pre-exchange period – when the financial issue finally surfaced, it was hard not to get worried. Fortunately, since the application for SEP was approximately a year ahead of actual travel, there was time to gather money – I did odd jobs which supplemented the support from a NASA award and my parents. Choosing exchange universities and mapping modules got really messy so I had to be alert and persistent. I decided to forgo the competitive and prestigious Universities for a less popular one. As a budding ecologist, nature was a much bigger draw than mappable modules, so New Zealand easily secured my vote. My motto when it came to SEP then was, “Fun is primary, studying is secondary.” The pictures below provide a tip of the iceberg impression in describing Auckland’s wonderful outdoor classroom experience! Honours student, Marine Biology Lab, Department of Biological Sciences. Biology 11 was the joint meeting organized by the Swiss Zoological Society, the Swiss Botanical Society, and the Swiss Systematics Society early this month. This annual meeting is aimed at bringing together biologists devoted to study ecology, evolution, behaviour and systematics in across various taxonomic groups, ranging from Orangutans to Cyanobacteria. This year, Nalini Puniamoorthy, a recipient of the NUS- Overseas Graduate Scholarships, was awarded the top prize for best talk out of nearly 30 student presentations. 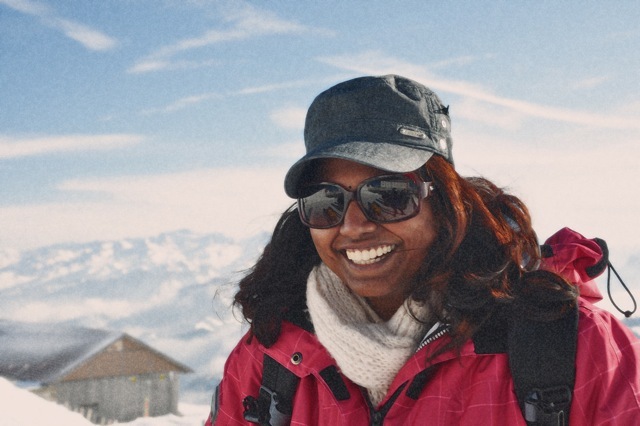 Nalini is a doctoral candidate at the Institute of Evolutionary Biology and Environmental Studies at University of Zurich. Her talk entitled “Geographic reversal of sexual size dimorphism in a dung fly, Sepsis punctum” represents a part of her doctoral research, which is aimed at investigating the morphological and behavioral divergence in reproductive traits among widespread species. Here are three podcast links from an interview conducted by BBC science radio site ‘Naked Scientists’ with James Guest on coral mass spawning. The longer version of the interview which ‘includes all the good stuff that Naked Oceans didn’t want to loose’.